New York Rangers President and General Manager Glen Sather announced today that the Rangers have agreed to terms with free agent forward Ruslan Fedotenko. Fedotenko is a two-time Stanley Cup Champion, having helped Tampa Bay capture the title in 2003-04 and Pittsburgh in 2008-09. He established a post-season career-high with 12 goals during the 2004 Stanley Cup Playoffs, and tied for second in the NHL in goals and game-winning goals (three), and ninth in the league with 14 points in 22 playoff contests. 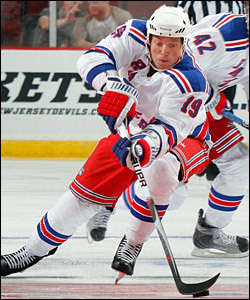 New Rangers forward Ruslan Fedotenko truly earned his spot over the past few weeks as a tryout player at training camp. He ended up leading the team in scoring with seven points in five preseason games. Fedotenko tallied both Lightning goals in the Cup-clinching 2-1 victory vs. Calgary in Game 7 of the Stanley Cup Final on June 7, 2004. During the 2009 Stanley Cup Playoffs, he established a career-high with seven playoff assists and tied his career-high, and ranked fourth on Pittsburgh, with 14 points in 24 contests. The 6-1, 200-pounder has skated in 677 career games with the Philadelphia Flyers, Tampa Bay Lightning, New York Islanders, and Pittsburgh Penguins, registering 150 goals and 158 assists for 308 points, along with 419 penalty minutes and a plus-15 rating. Fedotenko enjoyed his most productive season in 2005-06, establishing career-highs with 26 goals, 41 points and 164 shots in 80 games with Tampa Bay. In 2008-09, he tallied a career-high, 23 assists and plus-18 rating in 65 games with Pittsburgh. Fedotenko has also recorded 20 goals and 11 assists for 31 points, along with 54 penalty minutes in 83 career post-season contests with Philadelphia, Tampa Bay and Pittsburgh.